These pancakes are seriously the BOMB. 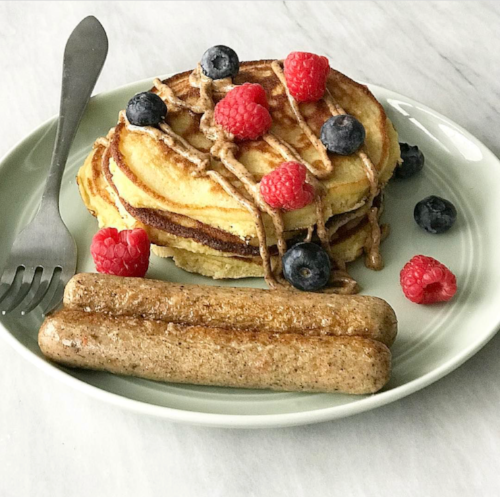 If you have a little extra time to whip up something tasty in the morning, you're definitely going to want to try these out. These babies are also gluten and dairy free if that is your thing! Pancakes remind me of the very best days of childhood -- both my Nona and my Mom used to make the most delicious and fluffy stacks. Some of my greatest memories include sleeping over at my Nona's house, with all of my little cousins, and enjoying a huge plate of pancakes together as soon as we woke up. You better believe we paired our meal with a tiny cup of coffee (mixed with milk and sugar of course!) because that's what Italians do. It didn't matter that we were kids, we sure do LOVE our coffee. Oh -- and if you're looking for an extra protein boost in your hotcakes, throw in a scoop of Further Food Collagen to your batter. You can use my discount code: nourishedwithnina10 for 10% off you order!